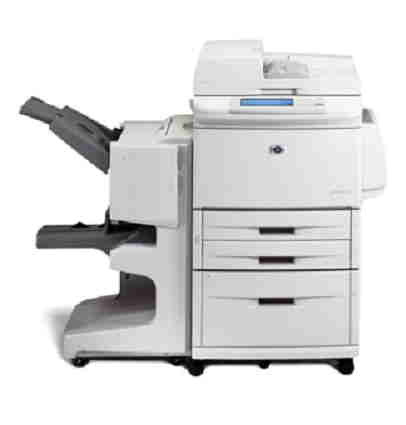 The HP LaserJet 9000 is a robust laser printer with a large monthly duty cycle of 300,000 pages. Print resolution is 600 x 600 dpi. The HP LaserJet 9000 has a 64MB memory that can be expanded up to 384 MB to accommodate more complex print outs as large as 11 x 17 inch media. For connectivity, only a parallel port is available on the HP 9000 LaserJet printer. The HP LaserJet 9000 series printer has a box-like shape with an output tray on top and paper trays at the bottom. The small control panel with functions buttons and LCD display is located on top. This unit can be used along with optional finishers. Print speed can go as fast as 50 ppm. The HP LaserJet 9000 monochrome printer is suitable for offices as it is reliable and it works on operating systems including Windows, Macintosh, and Linux. The LaserJet 9000 printer is very easy to use and delivers good quality output. Users dont have to wait long to get their prints either. Featuring a black toner with a yield of 30,000 pages, the HP LaserJet 9000 laser printer can be a very productive device. The HP LaserJet 9000 printer is affordable, but it lacks convenient features, including an automatic duplexer. The HP 9000 laser printer is now considered to be an outdated model and doesnt even have a USB port, let alone networking options like Ethernet or Wi-Fi.